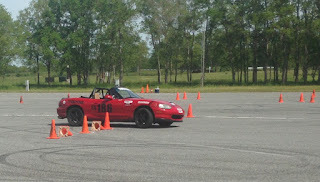 Jason working the little red machine through the cones on Sunday. Sunday Jason and I took the Miata down to Hutchinson Island outside of Savannah for a little more seat time. The good news is Jason took top PAX time of the day for the event! Major win for the little red car. The bad news is I was quite a bit behind and couldn't stop hitting cones all day. Some new vinyl work on the rear bumper. I'm still getting used to the car again and find myself making mistakes trying to keep the car at it's limit and not wimping out too much. I suspect it's going to take a few more events before I really start feeling the car again and can piece together all the good stuff I'm doing into a single run and see some results. Even with a poor performance, I was learning a lot each lap and pushing the car in different areas. It's all about putting in a solid performance in Lincoln in September! Onward and upward! Next stop is Myrtle Beach with SCR-SCCA on Saturday.